Some malwares (browser hijackers) have the ability to redirect your web browser(s) to malware-infested websites. This is achieved through the installation of a proxy server that will prevent you from changing your browser settings (restore your homepage or search engine). In situations like these, tools such as ZHPCleaner can help you clean your computer. 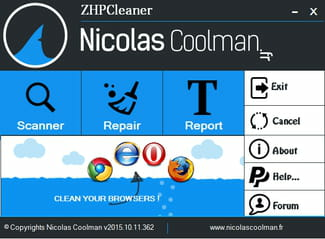 ZHPCleaner is free security software that specializes in malware removal (browser hijackers, adwares, PUPs, toolbars...). ZHPCleaner will help you to purge your PC from most known malwares. Furthermore, it is shipped with a built-in feature to help you restore your web browser configuration and proxy settings, thus putting a stop to browser redirections. ZHPCleaner is compatible with Windows XP, Vista, 7, 8, and 10 (32 and 64 bit versions). The software is available for free and requires no registration or installation. 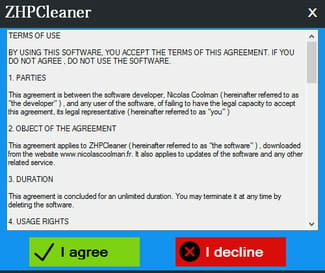 Click ZHPCleaner to download the software to your computer. When done, double-click on ZHPCleaner to create a launcher on your desktop. Leave the program to work. Warning: Sometimes ZHPCleaner will mistakenly detect legit files/processes as malware. Make sure to clear the checkboxes next to these files before clicking on the Repair button. You will need to reboot your computer to finalize the cleaning process. Click OK and restart your computer. 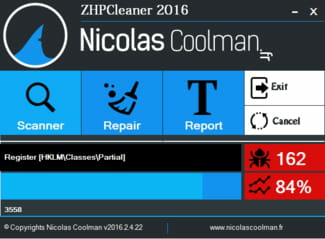 A report named ZHPCleaner.txt will be created on your desktop. If you need help deciphering the content of the report, please create a new thread on our security forum. N.B. ZHPCleaner will also create a directory in C:\Users\Username\AppData\Roaming . Here, you will find all the quarantined items as well as a copy of the analysis and cleaning reports. Published by deri58. Latest update on March 18, 2016 at 03:35 AM by Christina Langer. This document, titled "ZHPCleaner Tutorial," is available under the Creative Commons license. Any copy, reuse, or modification of the content should be sufficiently credited to CCM (https://ccm.net/).